CIS maintains a history of pop-up security alerts generated by its Antivirus, Firewall and Defense+ components and the actions taken against the threats discovered, depending on the response to the alerts by the user. 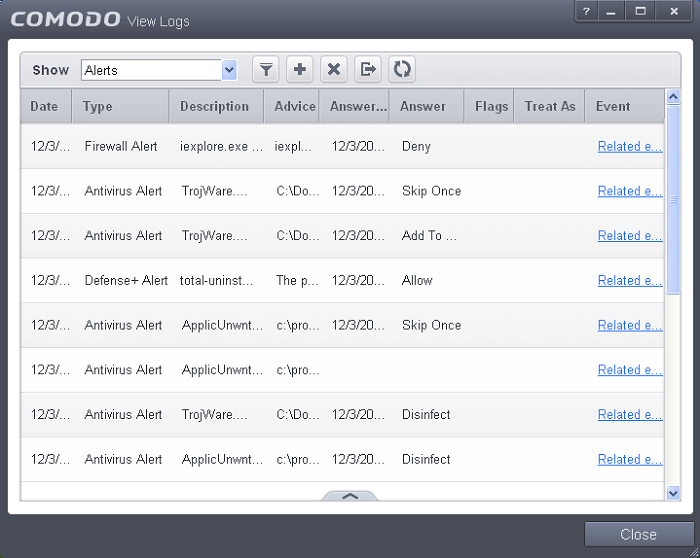 The Alerts logs can be viewed by selecting 'Alerts' from the 'Show' drop-down of the log viewer interface. Date - Contains precise details of the date and time of the alert generation. Type -Indicates the type of the alert, whether it is a, Antivirus, Firewall or Defense+ (HIPS, Behavior Blocker or Auto-Sandbox) alert. Description - Brief description of the file or the event that triggered the alert. Advice - Advice offered by CIS on how to respond for the alert. Answered – Indicates whether the alert has been answered by the user and if answered, contains precise details of the date and time of response from the user. Answer - Indicates the response given by the user. Flags - Indicates flags set for the kinds of actions against the event triggered by the file. Treat As - Based on the response how the file is treated, whether it is treated as a safe application, installer and so on. Event - Clicking'Related Event' opens the details of the event that has triggered the alert. To export the Alerts logs as a HTML file click the 'Export' button . To refresh the Alerts logs, click the 'Refresh' button . To clear the Alerts logs click the 'Clear' button .